I dub thee Palentine’s Day! With so much focus on Valentine’s Day this month, it’s important to remember to share the love with the pals in our lives. Whether you are single or in a relationship, take time this weekend to celebrate those friendships! I’ve partnered with the Paper & Packaging – How Life Unfolds™ campaign to share ideas on how to celebrate Palentine’s Day with your friends, whether it’s a small, thoughtful gift or spending time together. I once made a Happy Box for my friend Annie’s birthday, filled with silly trinkets and some of her favorite things. I thought a mini Happy Box would be the perfect gift to show a friend you are thinking of them for Palentine's Day. A box full of happy things is one of my favorite gifts and it can easily be adapted depending on the occasion. I decided to make two boxes for a couple of my long-distance friends turned pen pals. One of them absolutely loves baking so I found small cookie cutters and mini cupcake baking cups. I knew my other friend would appreciate cute desk accessories so I chose a candle and push pins. You can easily fill these boxes with other small gifts based on your friend’s interests. Here are some other ideas: a coffee gift card, silly trinkets, a deck of cards, snacks or candy, lip balm, nail polish, a small plant. The possibilities are endless. In order to keep these affordable, I challenged myself to keep the boxes under $10 each. Hello! 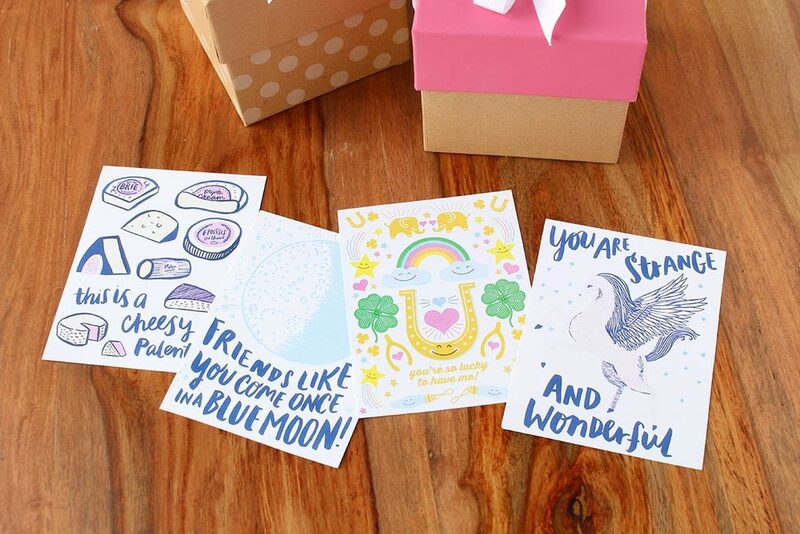 Lucky, an awesome stationary company, also partnered with Paper & Packaging to celebrate and they have provided a pdf of downloadable Palentine’s Day cards that you can print out to include in your box. I added the cards + chocolate to the boxes and, voila, a mini box full of love! • Movie Night: Score movie tickets to the newest release on everyone’s list and stock up on popcorn and candy! Or invite your friends over and catch up on Oscar-nominated best pictures. • Brewery Tour: Spend a fun evening sampling new brews and enjoying old favorites. • Game Night: Have a night of pizza and board games! • Dinner: Forget date night. Grab a friend with an adventurous palate and go to the Scottish-Mexican fusion restaurant you’ve been dying to try. • Try a class or workshop together! Find a creative studio. Whether it’s learning how to home-brew coffee or making flower crowns, I bet you can find an activity you and a friend would love to do together.